I was reading an article yesterday regarding the biggest organisms of our planet and it mentioned the Victoria Crowned Pigeon as being the biggest pigeon species currently in existence. I found its appearance quite intriguing so I decided to make a post about them on the blog. Their natural habitat ranges in the lowland and swamp forests of northern New Guinea as well as some of the surrounding islands. 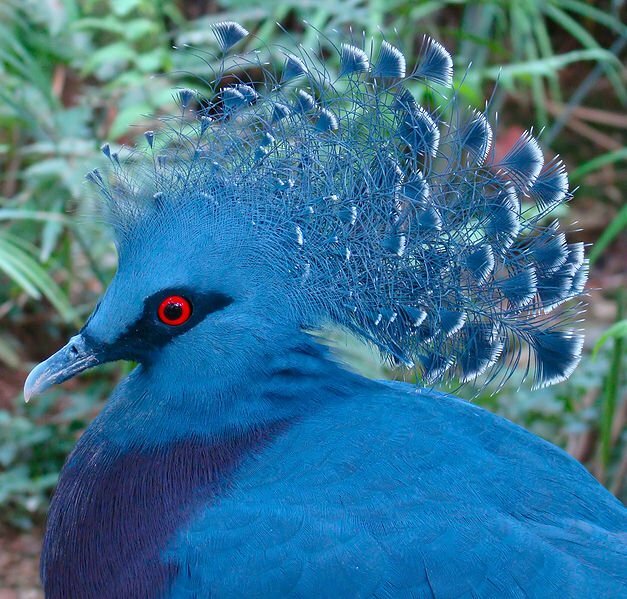 The Victoria Crowned Pigeon is a spectacular, very large and predominantly blue pigeon with an average length of 75 cm (29 inches) and an average weight of 2.385 g (5.3 pounds. 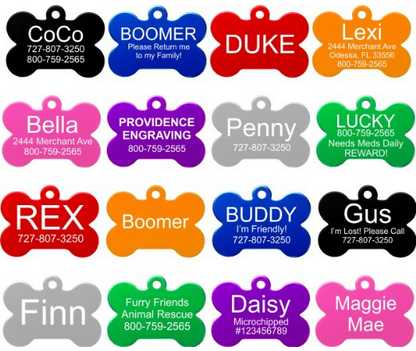 ), with males usually being slightly bigger than females. As you can see from the pictures it is not your everyday town pigeon, and it is as tall as a turkey! It's actually considered to be the largest pigeon in the world, just a little bigger than other crowned pigeon species. They have a large and elegant feather creast that can be raised in a crown-like fashion, maroon breasts and red eyes. They are reported to live for more than 30 years in captivity. Little is known about how these animals behave, since their habitat is covered by dense forest and observations are really hard to be made. However they are known to spend most of their lives on the ground, in pairs or small flocks. When they feel threatened, they use an aggressive display during which they turn sideways towards the opponent, raising their wings in order to look much larger. 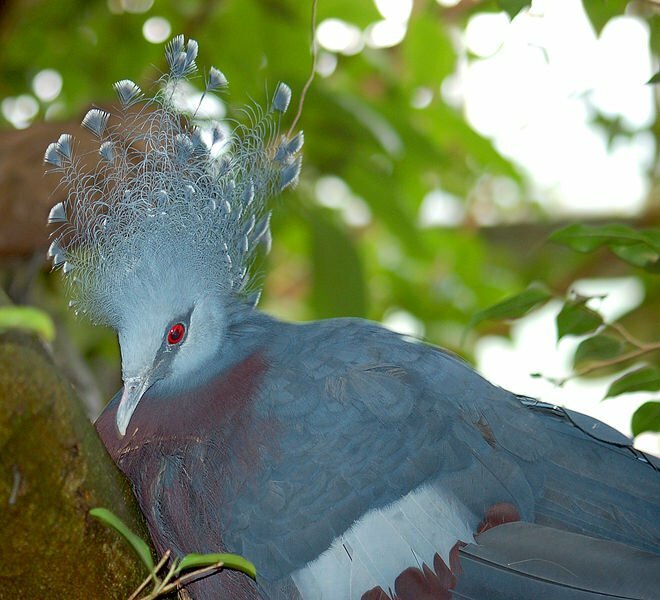 Victoria Crowned Pigeons are monogamous keeping the same mate during their whole lifetime. Typically the female lays only one white egg each year that is incubated for about 28 days from both parents. The newly hatched chick is atricial meaning that it requires a lot of care and feeding for many weeks to come. After about one month the chick looks a lot like the adults do, having already reached about 1/3 of an adult's size. During this phase it starts to learn how to fly and will eventually leave the nest. Similarly to many pigeon species, the parents use a highly nutritious crop "milk". This milk is generally known as “pigeon milk” and it is a semi-solid substance somewhat looking like pale yellow cottage cheese. It is exceptionally high in proteins and fats and containing more of them than cow or human milk. It also contains several anti-oxidants and immune-enhancing factors. The pigeon milk is produced by both males and females. Goura victoria victoria which can be found in Yapen, Biak & Supiori. They are really intelligent, easy to tame animals, having been bred in captivity for hundreds of years. There are a few U.S. aviaries breeding and selling them, however please be aware that they require a lot of room (more than the casual bird owner can offer) to exercise, stretch and play before buying one. Currently the Victoria Crowned Pigeon is listed as a vulnerable animal in the wild, both by the IUCN and the CITES. 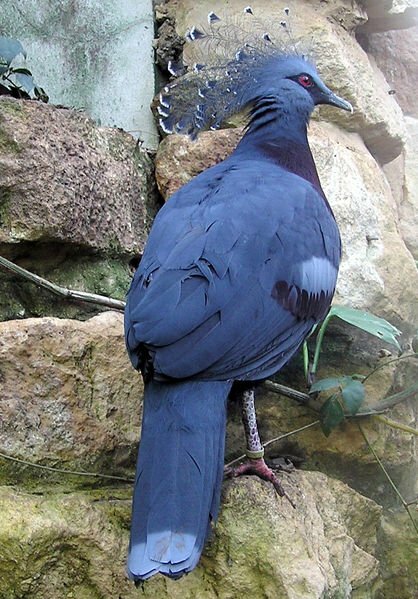 The total Victoria Crowned Pigeon population has greatly diminished during the past decades and the animal has disappeared in many areas that used to thrive in the past. Continuous habitat loss as a result of forestry and mining activities. Illegal hunting (for its plumes and meat) and illegal collection for selling in pet trade. Gorgeous bird! - really. Just discovered this blog. Try looking into the Cuckoo Bird. Not so beautiful but very odd behavior when it comes to nesting. Something not many people are aware of. - Again, enjoyed the post about the Crowned Pigeon.